Il TL431 è un circuito integrato a 3 teminali che fornisce un preciso riferimento di tensione. Opera come se fosse un diodo zener a basso coefficiente di temperatura. Programmabile da Vref a 36V con due resistenze esterne. Eccellente sostituto dei diodi zener in applicazioni come voltmetri digitali e circuiteria basata su amplificatori operazionali. The TL431 is a three−terminal programmable shunt regulator diode. This monolithic IC voltage reference operates as a low temperature coefficient zener which is programmable from Vref to 36 V with two external resistors. They exhibit a wide operating current range of 1.0 mA to 100 mA with a typical dynamic impedance of 0.22 Ohms. The characteristics of these references make them excellent replacements for zener diodes in many applications such as digital voltmeters, power supplies, and op-amp circuitry. 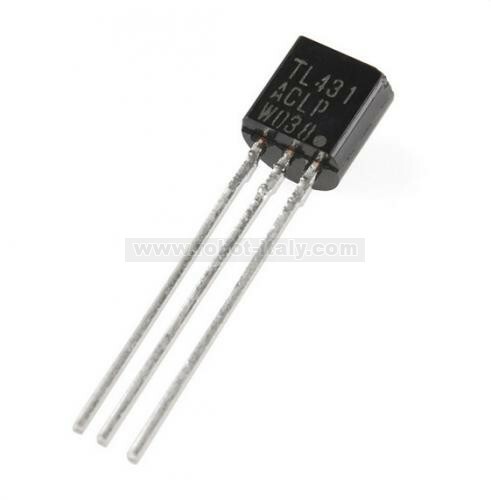 The 2.5 V reference makes it convenient to obtain a stable reference from 5.0 V logic supplies, and since the TL431 operates as a shunt regulator, it can be used as either a positive or negative voltage reference.